Do you like to win contests? a) Slam your hand repeatedly in a door? b) Poke your eye with a sharp stick? d) Take care of your husband/boyfriend when they’re sick. e) a, b, AND c. Or virtually anything to avoid the petulant, mewling infant masquerading as your husband/boyfriend. 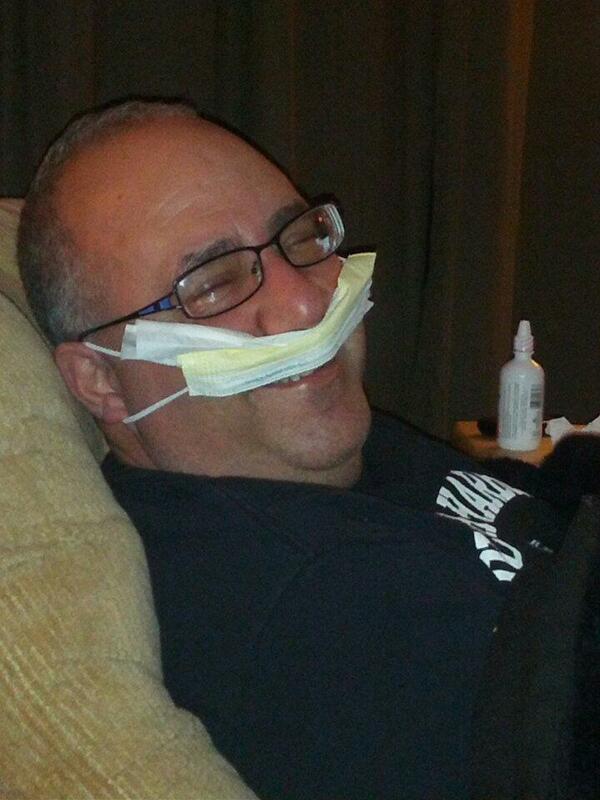 Recently, my husband underwent surgery to correct a deviated septum. For months, he has been unable to breathe at night through his nose, and instead resorts to a cacophony of puh’s and rhythmic, sinus-y, repeated “noooooood” sounds. Sorry, ladies, he’s taken. Guys like this are snatched up like *that. I invested in earplugs, and have gotten to be somewhat of an earplug expert, as I am able to put them in while still sleeping, when my beloved begins his discordant nightly lullaby. Thursday, Day One. Surgery Day. The surgery went very well, and we were told prior to the surgery that he would have nasal splints. Yes, splints in his nose. What we weren’t told is that once we got him home, our house would resemble the inside of a slaughterhouse. Bloody tissues, bloody washrags, bloody nose, fingers, nasal spray, and face. 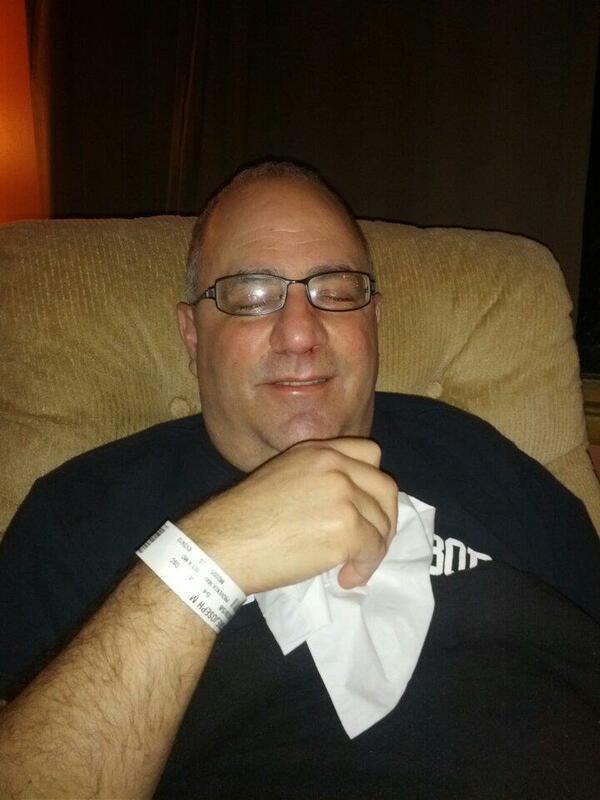 Joe’s in a constant haze of Vicodin, saline spray and antibiotics. Joe did not get much sleep. I thought that might happen, and gosh, I feel so bad. I bet he’ll sleep today, take lots of naps. And since I’m off work, I might get some writing done. This might be a good thing. It will be like caring for a newborn; he will sleep, eat, poop. Sleep, eat, poop. I prepare a wonderful lunch. After one bite he pushes it away. Poor baby. I guess the Vicodin is making his tummy hurt. I take the uneaten lunch back in the kitchen and begin a never ending, cycle of providing tissues, squirting him with nasal spray, cleaning out his nostrils with q tips (only gagging once) fetching antibiotics and Vicodin, and taking pictures. I feel needed. I don’t get much writing done and resort to playing games on my phone, most of which I can’t finish because he needs one thing or another, but that’s ok. He sleeps on the recliner again. I “go” to bed but don’t “stay” in bed, because he urgently needs me for one thing or another and wakes me up approximately 32 times. I’m tired but I love my pookie pants so I get up mostly to offer him moral support. Happier times. In the chair. It comes back to me how exactly a newborn sleeps. I am crabby from lack of sleep and both pinch myself and swill coffee regularly to stay awake. It’s not hard because the second I start something (including resting my head on a pillow) Joe’s Superpowers of Interruption kick in. I have given up trying to write. I have given up trying to read. I have given up playing games on my phone, even Ruzzle, which is a two minute game. It is for the best because my eyes are watery and red. I make a really good dinner which goes uneaten (by Joe, because he has no appetite and by me, because I’m full already—of resentment). I endure another day of nostril cleaning, Vicodin fetching, and making meals that Joe won’t eat. I hide in the bathroom with a can of Pringles and a Snickers bar but he finds me. The worst night of all. Like, nightmare bad. Due to clotting in the bad nostril, Joe is completely unable to breathe through his nose at all. I don’t understand why this is a problem and tell him so. I must have had a tone because he looks wounded. I don’t even try to go in the bedroom tonight but rather bring a pillow to the couch out in the living room near Sniffle Snifflepants. He struggles to breath. I tell him, “breathe through your mouth, honey” except “honey” somehow came out as “stupid.” I tuck the blankets around him, ensure he’s got tissues/nasal spray/headphones, turn the TV onto Soundscapes and lay down. I think now he’s going to be able to rest because after all, he’s gotten about one hour of sleep in the past three days. He lies there for approximately thirty seconds before he throws the covers back, sighing, and tells me, “I’m confused about how I should be breathing.” I stare at him in utter disbelief and wonder if I should use the pillow from the bedroom to smother him or just use one from the couch. …and even later Saturday night. He gives up on the recliner and lays on the sectional at a right angle to me. No sleep for either of us. He’s convinced the splints have come out and he will choke on them in his sleep. He might be right about the choke part but it won’t be the splints doing it. I have given up on all pretense of kindness. I am surly. I am unkempt. “What can I get/do for you” has died a mucous-y bloody death. I am suffering withdrawal from Facebook, Twitter, Words with Friends, and Ruzzle. I know now why I stopped after three children; I can’t do anything for more than two minutes without Snuffolupagus racing after me with nasal spray and/or Q tips and I can no longer stand the serene notes of Soundscapes without wanting to weep. Crankypants is hungry but won’t eat. Any patience I had is gone. I make him a sandwich he is not going to eat and it makes me feel better when I poke a hole in it with my finger on my way into the living room with the plate. He’s a manchild. I’m not going to name names but it appears someone has been dicking around with the Q tips without me and has caused a torrential flood of a nosebleed. I am instructed to call my EMT brother in law and find out what the best way is to stop the nosebleed because even though I have had first aid training and the aforementioned three children and have stopped enough bloody noses to last me the rest of my life, it’s not enough. I grit my teeth and call and I’m given the magic instructions…pinch bridge of nose, put a small roll of gauze in between frenem and top lip and ice the forehead. The nosebleed stops but the whining does not. Pookie Pants Honeybear is now two weeks post-op. He’s doing great. He’s slept more in the past three nights than he has in a very long time. ***most of this is not true.